His Holiness Abune Dioskoros has been elected 4th Patriarch of Eritrean Orthodox Tewahdo Church that was unanimously approved by the Holy Synod. The EOC happily announces to the people that the appointment of His Holiness Abune Dioskoros took place on 19 April, during a meeting of Eritreans monasteries, representatives of religious administrations and the like. 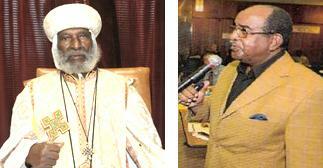 Yesterday, April 19, 2007, in a convocation attended by government authorities, Mr. Yoftahe Dimetros, the lay political appointee who serves as the highest administrator of the Eritrean Orthodox Church, and his handler, Security Chief Semere Beyen, rounded up the reluctant bishops that make up the rump synod and made the much anticipated announcement. The announcement that was presented to the assemblage as an accomplished fact simply stated, “Abba Dioscoros, the former bishop of the Mendefera region, has been chosen to serve as Eritrea’s next patriarch. [“] When the bishops in attendance expressed a desire to bring the matter to a deliberation, they were told that the announcement was not open for further discussion. …Mr. Dimetros and Co. took this shameful step, as always, on the behest of the People’s Front for Democracy and Justice (PFDJ), the ruling party, to implement its designs of destroying the Eritrean Orthodox Church…It should be known to everyone that Abba Dioscoros has long sold his soul to Mr. Yoftahe, the devil incarnate. In the last two years, he has been at Mr. Yoftahe, the patriarch-maker’s feet in the foolish hope of being the next patriarch. In direct violation of the constitution of the EOC, the government will now appoint a compliant replacement Patriarch. 4. The Holy Myron that was handed down to the Eritrean Church from St. Mark. The two priests that were sent by Mr. Yoftahe Dimetros to undertake such shameless act were Keshi Fitsum Tesfai[Priest at St George, Alfaramio, Asmara] and Keshi Gebretatyos Kidane [Priest at St Atnatios, Godaif Asmara]. Trawling around the internet, it appears that Dimetros is the son of Keshi Dimetros, a fanatical pro-Ethiopian politician from the 1960s, and some discussions suggest he may also be descended from Dimetros Gebremariam, an Eritrean churchman who was also a pro-Ethiopia “Unionist”. Both of these men used religion for political ends, but I can’t see any ideological connection between their activities and Yoftahe Dimetros’s scheming on behalf of the current Eritrean government. U are an unconscionable idiot. You do not know my grandfather or my uncle. They are amazing patriots. You have no idea of who they are, you are just a hateful prick passing for a journalist. Do your research, then check and double check the facts!